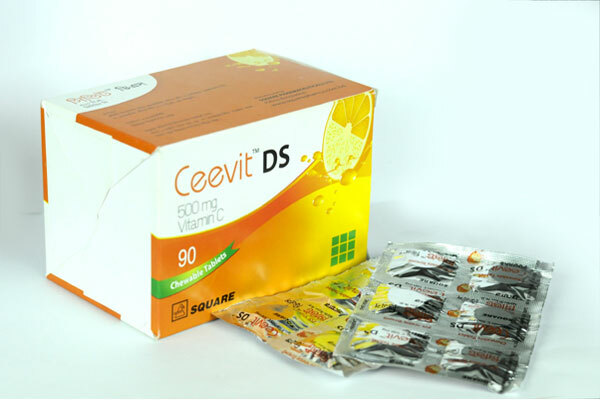 CeevitTM DS is indicated for prevention and treatment of scurvy. It may be indicated in pregnancy, lactation, infection, trauma, burns, cold exposure, following surgery, fever, stress, peptic ulcer, cancer, methaemoglobinaemia and in infants receiving unfortified formulas. It is also prescribed for hematuria, dental caries, pyorrhea, acne, infertility, atherosclerosis, fractures, leg ulcers, hay fever, vascular thrombosis prevention, levodopa toxicity, succinyl-choline toxicity, arsenic toxicity etc. For the prevention of scurvy: 1 tablet daily. For the treatment of scurvy: 1-2 tablets daily; but dose may be increased depending on the severity of the condition. For the reduction of risk of stroke in the elderly: 1-2 tablets daily.